The process-oriented approach in a modern utility structure requires the integration of technical activities, functions, information, technology, economical analysis, managerial issues, and business rules. The digital utility platform shall serve the complex business processes associated with new business environment and market forces from the day-to-day business activities to the highest decision making process. NEEDS major challenge is to position the "Digital Utility" as a basic requirement for the success and modernization of the regional utilities' business and services. The Digital Utility transformation aims at reducing capital investment, increasing operational efficiency, maintaining high quality of services, and adopting the business driven approach. 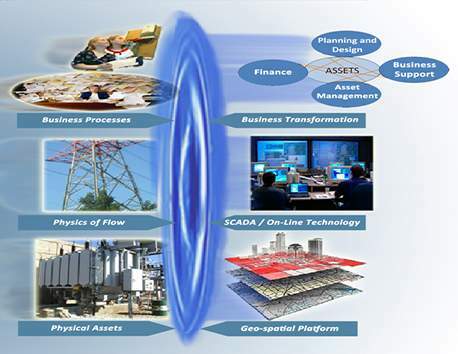 The development of a solid digital platform provides a broad mirroring of the physical assets, comprehensive modeling of the physics of the electricity and water flow, and enterprise vision to the business environment. The mirroring process must be dynamic in time and able to replicate any changes and new developments in the business reality into the digital environment, independent of the scale of the assets facilities, operational changes, and business processes. The realization of the Digital Utility is the key success factor to face the sustainability challenge in an investment-intensive environment such as the utility business.